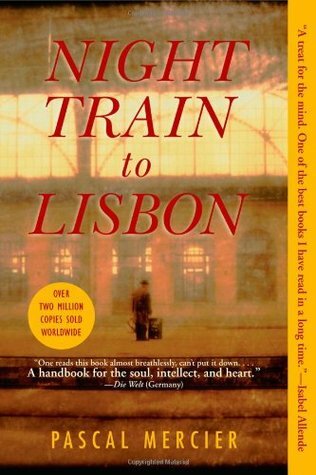 It seems the actual theme for the month of August never went up, so I'm hastily putting together reviews for various books I did read over the course of the month, starting with Night Train to Lisbon. While this is not an uninteresting plot, the strength of the book lies in the writing. At the end of the day the book essentially serves as the reflections of one man, and this makes his internal narrative crucial. Mercier delivers on this front with a beautifully written, introspective look at what truly matters. The philosophical tone is crucial to what makes this book work, really. It's not the most eventful book, and apart from the protagonist nobody else really gets fleshed out. So I have seen as many negative reviews online as I have seen positive ones, this being a book that could potentially bore people. On the location front, it should be noted that this book does not start out in Lisbon, and a good chunk of it takes place on a train, but every now and then (and more so towards the end) the historical setting of Portugal in that era shines through. If you're okay with reading this for the lovely writing style and introspective nature, I recommend going for it. It's not quite Calvino, but I can occasionally see enough Calvino in the writing to keep my biased self going all the way through.